If you’re anything like me, your Gmail inbox is clogged with countless promotional emails, sales fliers, app reminders and all sorts of other clutter that makes it hard to find the important stuff. Sure, Gmail does a decent job by filtering a lot of this spam for us and giving us a real unsubscribe option. But Time Techland writer (and friend of Techlicious) Doug Aamoth has an even better suggestion for stopping spam: Add a plus sign to your Gmail address. Say you’re signing up for access to a new website or app you’re worried will harass you with emails. Instead of giving the company youremailaddress@gmail.com as your address, give it youremailaddress+spam@gmail.com instead. Its emails will reach you, but with some simple filtering, it will be automatically relegated into a low-priority folder away from your more important communications. From there, you can choose to automatically archive messages sent to that address or automatically send them to a spam folder. That’ll keep the nuisance messages out of your main inbox. You can choose to automatically delete these spam messages, but that’s not recommended – you may need to recover a password or other information later. 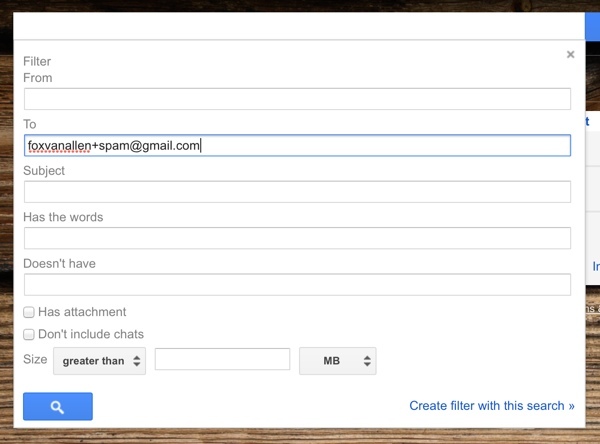 For more on managing your inbox though disposable Gmail addresses, check out the video below. Then check out these 5 tips for getting the most out of Gmail. While I’m sure this sounds like a good suggestion to the neophyte email user, this is very easily bypassed. if I was a spammer harvesting email addresses, I would simply strip off any and all characters from the plus sign to the at sign. This isn’t high tech security, but it’s at least a bit more obscure tan the technique in the article, and you can still filter messages on it. I am unfamiliar with Gmail. Is it possible to run an automatic filter of some sort on its inbox to send mails without a + character to a spam folder? Can you do something like this using hotmail? See which ones bounce back as undeliverable, or don’t show up in your inbox, and which ones you do receive. I have my own domain and I just assign separate emails for each site I do business with, then forward those emails to my real email address. It takes a couple of minutes to add a new email address, but for me it is worth not having too much spam land in my email account. FWIW, I have been spammed by large financial institutions, airlines, etc. If you are interested, I use Hostgator’s forwarders.